Seriously, until this recipe, I’d never found a made-from-scratch brownie that tasted as good as brownies from a mix. But these brownies are just what brownies should be — rich, chocolatey, and moist. We came across them sort of by accident. Megan wanted to make brownies, so she looked up a recipe, mixed them up, and then asked me how long to bake them for. When I looked at the cookbook, I saw that the recipe was in the microwave cooking section. Hmmmm. We decided to try baking them in the oven anyway, and they are just amazing. They won first prize at the fair when she entered them two years ago. So go ahead — try them! Beat together in small bowl for 1 minute at medium speed until light. Stir in. Spread batter evenly in 8-inch-square dish. Bake at 350* for 25 min. This next bar cookie is one I got from my sister. 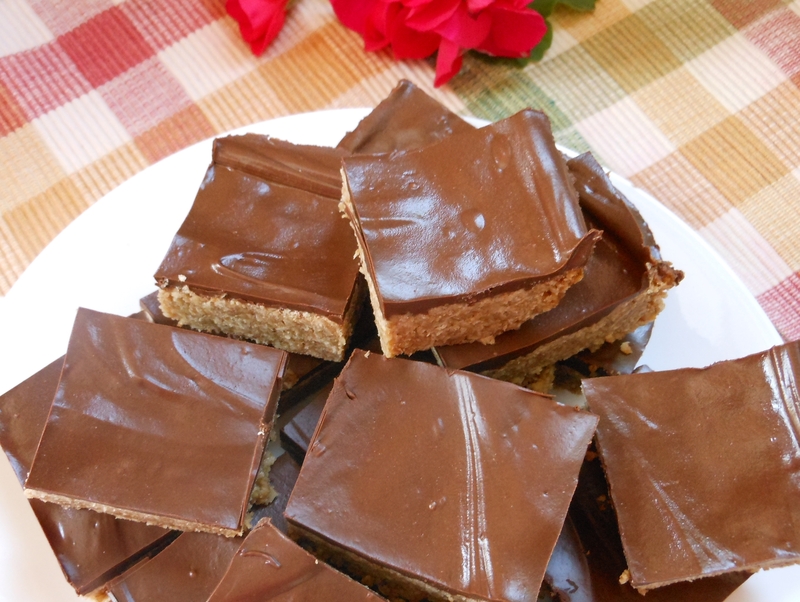 Anything made with peanut butter, oatmeal, and chocolate, has to be good, right?! In a mixing bowl, combine first five ingredients. Gradually add the oats. Press into a greased 9×13 in. pan. Bake at 400* for 12-14 minutes or until just the edges are golden brown. Cool five minutes. Stir until blended and spread over warm bars. Cool completely, then refrigerate for 2 -3 hours before cutting. And this last one is a favorite from my growing up years. The name doesn’t exactly make you think, “Ummm, sounds delicious!”, but trust me, they are. They have a warm, buttery flavor that makes them so, so good. Spread into greased 9×13 pan. Bake at 350* for 30-35 minutes, or until golden brown. 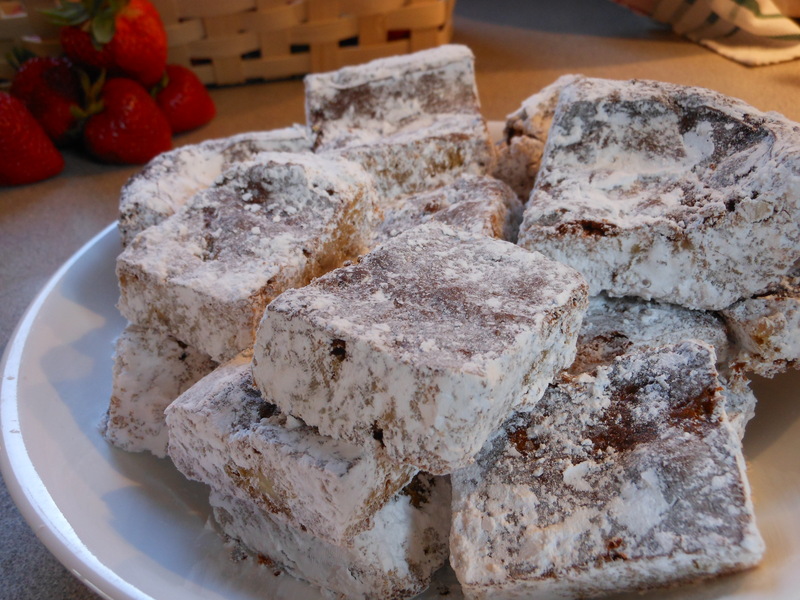 Cut into squares and coat with powdered sugar. Bar cookies are easy for kids to make. We love drop cookies, too, but when we don’t feel like taking the time to scoop out all those balls of dough, we mix up one of these favorites, spread them in a pan, and 30 minutes later they’re ready. I like the way you think, Rachel! As a fellow baker and chocolate lover, I am always on the quest for the best brownies. I can’t wait to try these! Rachel it’s been so fun to find your blog through Facebook. Can’t wait to read more…We are still homeschooling and also using Charlotte Mason ideas. Since the beginning, I have been inspired by her philosophy and intrigued by her methods. Looking forward to reading more about you are doing it. Megan is looking forward to making a felt book like the one your daughter made, and we will definitely give these bars a try too. We’ll have to try your recipe. One of my daughters spent years trying to come up with the best brownie recipe ever. I’ll send her a link to this post. 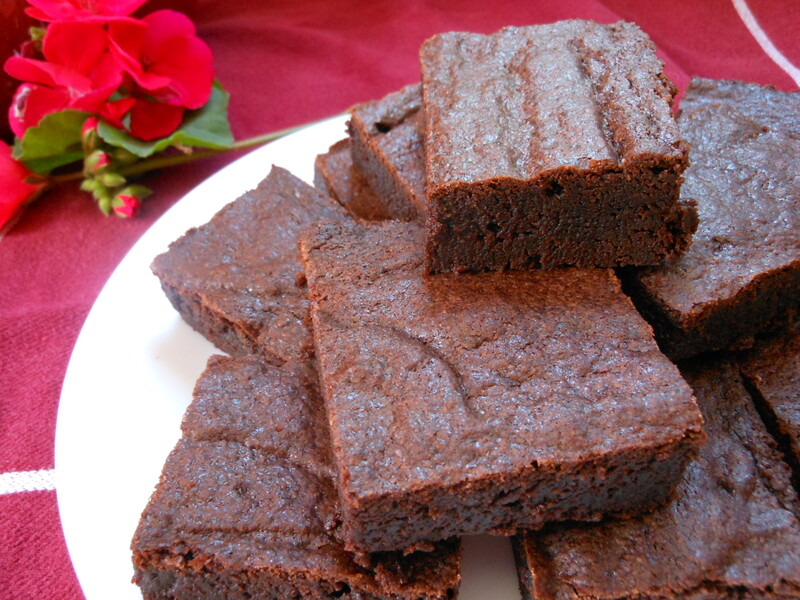 All the other brownie recipes I’ve tried end up tasting bland and cakey, not rich and moist. This one always turns out great. I’m sure my family would love it if I’d add choc. chips too!